An American charter jet carrying Italian vacationers to the Caribbean crashed into a fog-shrouded mountain in the Azores today while trying to land and all 144 people on board were believed killed. The Boeing 707, with a seven-member American crew, was approaching Santa Maria Airport when it hit Pico Alto and burst into flames, said Afonso Pimentel, a reporter in the Azores for the Portuguese news agency LUSA. The crash took place at 1:30 P.M. local time. The Portuguese state television said an emergency team that arrived in Santa Maria was told there was no hope of finding survivors on the mountain, which is 1,794 feet high. 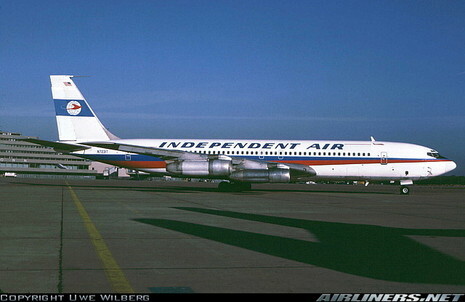 In 1989, Independent Air Flight 1851, a Boeing 707-331B on an American charter flight from Bergamo, Italy to Punta Cana, Dominican Republic, struck Pico Alto on approach to Santa Maria Airport in the Azores for a scheduled stopover. The aircraft was destroyed with the loss of all passengers and crew. After being cleared for the ILS approach the crew failed to accomplish an approach briefing, which would have included a review of the approach plate and minimum safe altitude. If the approach plate had been properly studied, they would have noticed that the minimum safe altitude was 3,000 feet and not 2,000 feet, as it had been understood, and they would have noticed the existence and elevation of Pico Alto. At 14:06, the flight was 7.5 nm from the point of impact, and beginning to level at 2,000 feet (610 meters) in light turbulence at 250 KIAS. At 14:07, the flight was over Santa Barbara and entering clouds at approximately 700 feet (213 meters) AGL in heavy turbulence at 223 KIAS. At 14:07:52, the captain said, "Can’t keep this SOB thing straight up and down". At approximately 14:08, the radio altimeter began to whine, followed by the GPWS alarm as the aircraft began to climb because of turbulence, but there was no reaction on the part of the flight crew. At 14:08:12, the aircraft was level when it impacted the ridge of the mountain. It collided with a rock wall on the side of a road at the mountain top at an altitude of approximately 1,795 feet (547 meters) AGL. 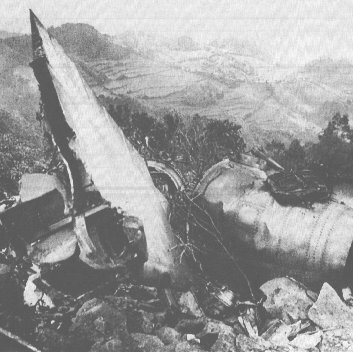 In the Azores 144 people were killed when an American-chartered Boeing 707 filled with Italian tourists slammed into fog-covered Santa Maria mountain.